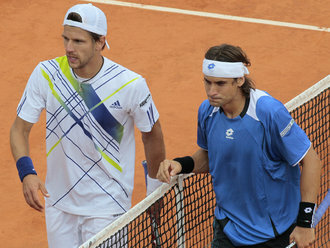 Melzer and Ginepri upset Ferrer and Ferrero in Saturday’s singles. Ninth seed David Ferrer was a shock casualty in the third round of the French Open in a straight-sets defeat by Jurgen Melzer at Roland Garros. Ferrer came into the tournament as one of the form players on clay, but was simply blown away by his Austrian rival. Melzer took less than two hours to triumph 6-4 6-0 7-6 and secure a first appearance in the fourth round, where he will meet Teimuraz Gabashvili. The Russian qualifier had earlier dispatched sixth seed Andy Roddick in straight sets. Robby Ginepri is the only U.S. man in the French Open’s fourth round after upsetting 2003 champion Juan Carlos Ferrero. The 98th-ranked Ginepri, of Kennesaw, Ga., beat the 16th-seeded Ferrero of Spain 7-5, 6-3, 3-6, 2-6, 6-4 Saturday in a match that lasted more than three hours. Ginepri was 1-7 in 2010 before the French Open. This is Ginepri’s second trip to the fourth round at Roland Garros. He also made it that far in 2008, but lost in the first round in six other appearances at the clay-court Grand Slam tournament. The 17-year-old Tomic and former US Open quarter-finalist Ginepri fought a close match but the Aussie was too good, winning the first set in a tie break 7-4 before taking out the second set 6-4. Last year Tomic made it to the second round at Melbourne Park and he is hoping to go further in 2010. Ginepri is a handy scalp for Tomic to take in his budding career, with the American the winner of three ATP titles. “I’d definitely like to do better than I did last year,” Tomic told AAP. “I played well, I knew what I had to do against him. Ginepri said Tomic was a player to watch, but was keen to play down the significance of the loss in the exhibition event. “It’s an exhibition, so I don’t know how much people consider a win in these things – they take it with a grain of salt probably,” he said. “But any time you get a win it’s a good thing and I’m sure he’s been working hard. Ginepri will have to defend his Indy title in Atlanta next year! The ATP Tou r will return to Atlanta next season after the series purchased the sanctioning rights from the event in Indianapolis. The ATP board last month voted to buy the Indianapolis sanction under rules which allowed the ATP to match any offer made for the event. The hard-court tournament in Atlanta will be held over the week of July 17-25 2010 and marks the first time an ATP Tour event has been held in the US city for nine years. Mark Young, ATP chief executive officer for the Americas, said: “This is a great win for the parties involved and is a wonderful example of co-operation and understanding between different authorities in tennis coming together to achieve the common goal of promoting and developing tennis in the United States. The host club for the hard-court tournament, to be held from July 17-25, is yet to be determined, though a decision is expected by mid-January ahead of ticket sales. The first stop on the US Open Series – dubbed ‘the greatest roadtrip in sport’ by marketeers – starts two weeks after the European clay and grass court seasons end, and has traditionally struggled to attract European players capitalising on extra time around their local training bases. But Oakes said he has already heard from the agents of two top-10 players. Robby Ginepri, this year’s champion at the Indianapolis event, is expected to ‘defend his title’ in Atlanta. Previous winners from the Atlanta tournament, in its many guises, include Andy Roddick in 2001, Pete Sampras in 1998, Andre Agassi in 1989, 1991, and 1992 and John McEnroe in 1985. There will be a 32-player draw in singles and a 16-team draw in doubles. Young guns & old farts to play in Adelaide! Rising tennis teen Bernard Tomic will finetune for the Australian Open by playing at the World Tennis Challenge. Tomic, 17, has agreed to play in the novel World Tennis Challenge in Adelaide next January. The Adelaide tournament, in which a retired star partners a current player in a teams format, ends only four days before the Australian Open starts in Melbourne. Tomic will partner Wimbledon champ Pat Cash, who at age 44 is 27 years his senior. The Tomic–Cash combination will represent Australasia in the Adelaide event, opposed to three teams – the Americas, Europe and the Internationals. The Americas team features 50-year-old John McEnroe and Robbie Ginepri while French 46-year-old Henri Leconte will play for Europe with an as yet un-named teammate. World No.14 Radek Stepanek will head the Internationals with a yet to be announced retired player. Tomic this year became the youngest player in the Open era to win a main draw match at the Australian Open. Currently ranked 286 in the world, Tomic expects to be given a wildcard into next year’s Australian Open. “I can’t wait to play in Adelaide … playing alongside some of the greats will be a great learning curve,” he said in a statement on Tuesday. “WTC is a fantastic concept and I think it will be great to play with Pat alongside some of the legends of the game. The WTC, first held earlier this year, will be held at Adelaide’s Memorial Drive from January 12 to 14. The format pits the two current players against each other, followed by the past players. The teams then join for a doubles match. Marat Safin wants one more before he retires. Marat Safin took the court Tuesday evening for his first-round match against last week’s Indianapolis champion Robby Ginepri and rallied for a 3-6, 6-3, 6-4 victory. Towering American John Isner bounced seventh-seeded German Benjamin Becker out of the LA Tennis Open with a 7-6(8), 7-6(3) win. Isner continued the form that took him into last week’s Indianapolis semi-finals as he fired 15 aces and dropped just four points on his first serve. Isner, a 2007 NCAA finalist at Georgia Tech, improved to 3-0 lifetime against Becker, who captured the NCAA title at Baylor in 2004. Neither player conceded a break point opportunity in the first set, but in the second set both players dropped serve once, with Becker also forced to fight off an additional seven break point chances against him. Isner started this week at a career-high No. 77 in the South African Airways 2009 ATP Rankings. Former Australian Open finalist and World No. 8 Marcos Baghdatis saved eight of nine break points he faced to defeat Indianapolis semi-finalist Frank Dancevic 7-6(3), 6-3 to reach the second round, where he will play Isner. The Cypriot, who is also a former Wimbledon semi-finalist, has slipped to No. 146 in the South African Airways 2009 ATP Rankings. Baghdatis began the year strongly with a fourth-round showing at the Australian Open and quarter-final appearance in Johannesburg, but he last won consecutive matches on the ATP World Tour back in February at Delray Beach, when he also reached the quarters. Baghdatis saw his ranking plunge during the grass season when he suffered a left knee injury at ‘s-Hertogenbosch, which forced his withdrawal from Wimbledon, where in 2008 he reached the fourth round. Could Ginepri be a late bloomer? Boosted by a series of outstanding junior achievements, Robby Ginepri was often held up as the future of American tennis alongside his long-time friend and junior rival Andy Roddick. Undefeated throughout the 1999 junior season and a 2000 junior US Open runner-up to Roddick, Ginepri turned professional in 2001 at the end of his high school year and it seemed the only way would be up. But while Roddick went on to triumph at Flushing Meadows and consistently challenge the likes of Roger Federer and Rafael Nadal deep into the second weeks of Grand Slams, Ginepri found it harder. To this day his best world ranking remains the 25th place he achieved briefly in February 2004. His best Grand Slam performance is his semi-final appearance at the 2005 US Open, where he lost to Andre Agassi. But for the large part, Ginepri has had to be placed among that ever-growing group of US players who have failed to turn stellar junior displays into senior glory, leaving Roddick to carry the flag pretty much on his own. Ironically, just a month after Roddick experienced some kind of career redemption in the form of his tremendous performances at Wimbledon, Ginepri also celebrated a little more modest success. After a season ravaged by injuries, including appendicitis in March which kept him off tour for most of the spring, Ginepri won his first tour title for four years at Indianapolis this week. Ginepri – whose last title was in the same tournament – beat fellow American Sam Querrey for a triumph which he admitted was unexpected, and which will likely steer him towards the US Open safely back in the world’s top 50. And afterwards Ginepri admitted his long title drought and gradual slide down the world rankings had led him to question whether, at the young age of 26, he still had a future in the sport. Even aside from illness, Ginepri has had a fairly grim year. He only passed the first round four times in 10 tournaments leading into Indianapolis, never progressing past the second round. At Wimbledon, he was embarrassed 6-4 6-1 6-1 in the first round by Lleyton Hewitt. It was Ginepri’s seventh straight appearance in the main draw at the All England Club – and his fifth straight defeat. Little wonder Ginepri is relishing his out-of-the-blue triumph at Indianapolis. “This is a true confidence boost for the summer,” he added. “I feel fit and ready to fight some more. Robby Ginepri a repeat winner in Indy. Robby Ginepri returned to the winner’s circle at the site of his last ATP World Tour triumph, defeating No. 3 seed Sam Querrey 6-2, 6-4 in an all-American final Sunday at the Indianapolis Tennis Championships presented by Lilly to capture his third title. Ginepri collected $80,000 and 250 South African Airways 2009 ATP Rankings points with the victory at the ATP World Tour 250 tennis tournament. He also assumed the lead in the Olympus US Open Series Bonus Challenge standings following the first week of the North American summer hard-court circuit.